The FishingLicense.org team knows fly fishing is one of America’s great forms of recreation, but finding the right location can prove difficult. Luckily, we live in a country that is home to some of the best fly fishing locations in the world, and many of them are open year-round. If you are ready to plan your next big fly fishing trip, try adding one of the following destinations to your travel itinerary. If you are truly in love with fly-fishing, the FishingLicense.org team believes that you should take a trip to Bighorn River in Montana. Swimming with brown trout and copious numbers of insects, Bighorn River is the ideal place for an experienced fly-fisher. If you are hoping to avoid crowds, or you simply want to take in the beauty of the landscape alone, try visiting during the fall season. Would you enjoy a guided fly-fishing tour that traversed some of the most beautiful land on the North American continent? If the answer is yes, the Alagnak River in Alaska may just be your ideal destination. Famous for its large rainbow trout and numerous species of salmon, the fishery caters to anglers of all experience levels. Staffed with knowledgeable guides, the fishery allows everyone to try their hand at fly-fishing, and trips to other locations in the area can be arranged as well. The landscape is also inhabited by beavers, brown bears, bald eagles, caribou and moose, so it is perfect for animal-lovers as well. Known for its relaxed atmosphere and gorgeous setting, Mountain Home, Arkansas is located in the Ozarks. Home to numerous lakes teeming with flies, trout, bass, walleye and striper, Mountain Home offers over 170 miles of streams. The area has also maintained its natural splendor due to its lack of residential and retail developments. Are you a fan of catching huge trout? Would you like to visit one of the most productive freshwater fishing spots in North America? If you answered yes to both of these questions, FishingLicense.org recommends you check out the San Juan River in New Mexico. The river is home to an impressive number of brown, rainbow, and cutthroat trout, and nine-pound catches are common here. The fish population is consistent year-round, so there is no need to worry about empty waters during the off-season. 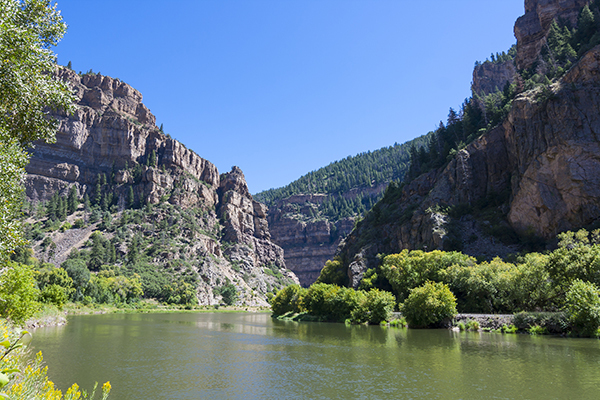 Offering spectacular vistas of canyons and a near-perfect climate, Glenwood Springs, CO is the state’s most popular fishing location. The area is home to both the Colorado and Roaring Fork Rivers, and just a short distance away from other locations. With more than 300 sunny days a year and affordable lodging locations, serious fly fishers will enjoy access to large numbers of trout and virtually every type other type of freshwater fish in the United States. Home to an enormous population of steelhead, trout, salmon and bass, Traverse City, Michigan is consistently ranked as one of the top fly fishing destinations in the country. The FishingLicense.org experts also knows that you will enjoy the many affordable lodging options in the area, and nature-lovers will greatly appreciate the majestic scenery.